Affords to add scripts for google customer review program. Choose which products 'll be part of the program, triggers opt-in forms on order confirmation and add customer reviews badge on every pages of your site ! You are free to use which third party 'll be your partner to obtain some customers feedback after they process an order over your shop. Ekomi, trust pilot, etc, can do that for you but the only matter with this is that those services are not free. Google launch its own service for customer review, available on your merchant center account. Once added to your account, this service affords Google to ask some of your customers about their buyer experience over your site. This free service affords you to display ratings stars over Google serps or Google ads. 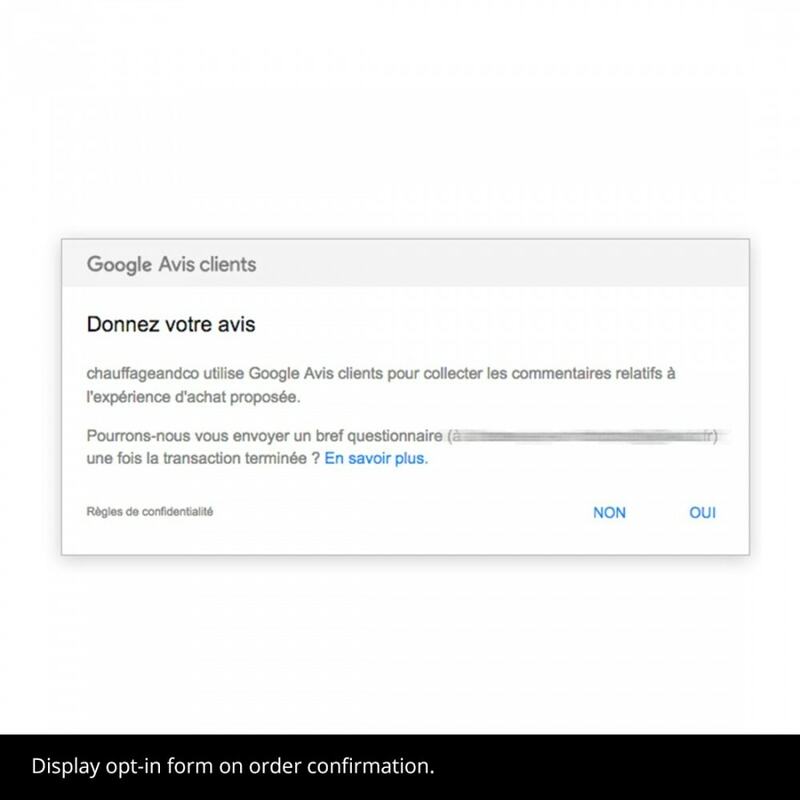 Once installed, the module 'll display the google opt-in form on your order-confirmation page. This can be a little scary : some merchants are not really enthousiasts because some of their products are sometimes not appreciated by their final customer. 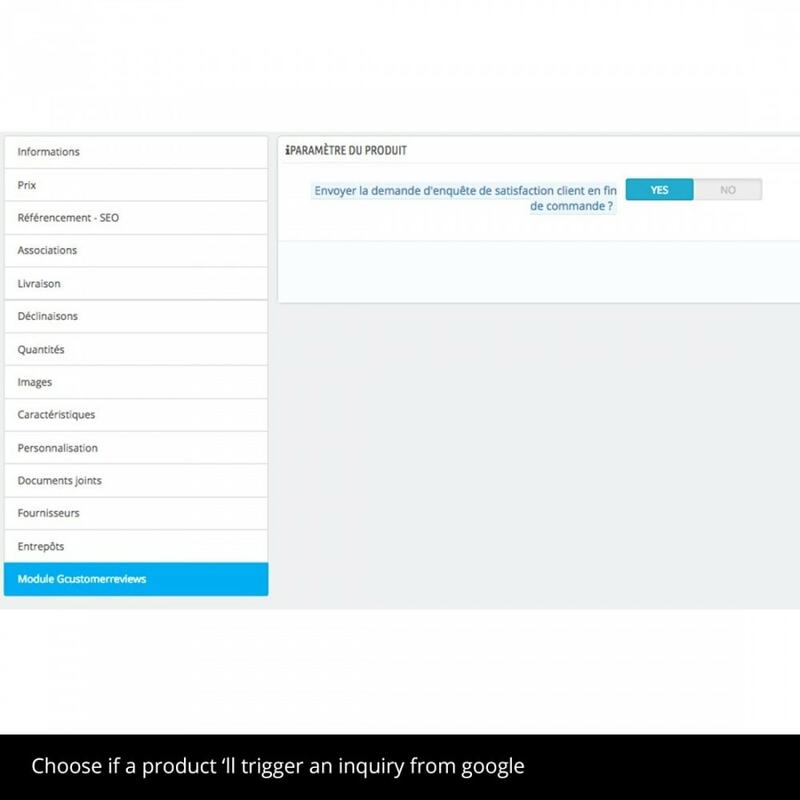 In that way the module affords you to choose which product 'll trigger an inquiry from google services. 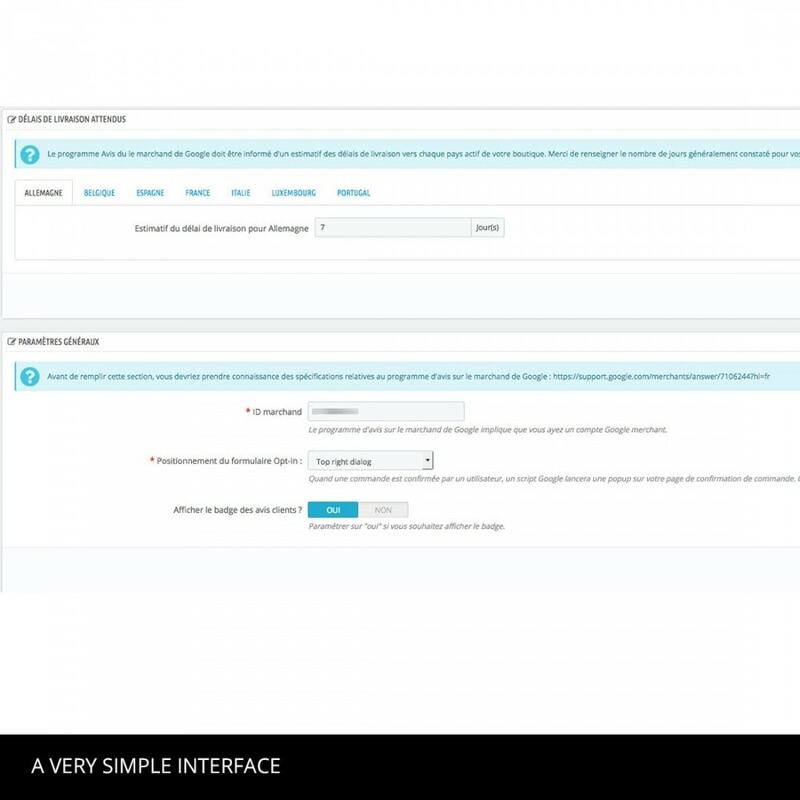 A form is available on each product pages of your backoffice, affording you to choose if the product, when taking part in an order, 'll trigger the opt-in form. You can also choose the position of the opt-in form and also inform Google (as it is required in the customer review program) about your delivery time in day in each of the available countries (and their states) of your shop. Choose wether or not your site 'll send ordered products GTIN's to Google's customer review program. Badge can now be positionned. Affords to get Ld+JSon rich snippets over your eshop. Let's optimize your Google Merchant Center product tracking : now, product with attribute's additionnal cost we be available for your remarketing and shopping campaigns. Simply build a feed for Google Merchant Center, also compatible for Facebook ad and Bing Ads. Sell more and prepare yourself to make greats shopping campaigns ! Affords to export your orders and order slips between two dates, via CSV and PDF, in one click !